How Truejodi is filling the loophole in the matrimonial sites? Truejodi is a matchmaking website that brings transparency in the matchmaking with its 9 step verifications and zero-tolerance towards frauds. The company is trying to solve the problem of removing fakes profiles. Users are awarded trust ratings based on the information they verify. This helps others take a better call on their match. Various points are verified under the process including Photos, ID proofs, education, income, address and with medical proof. Why we chose Truejodi as Startup of the Week? The startup solves a very important problem in online matchmaking. Truejodi has zero tolerance towards fraudulence. 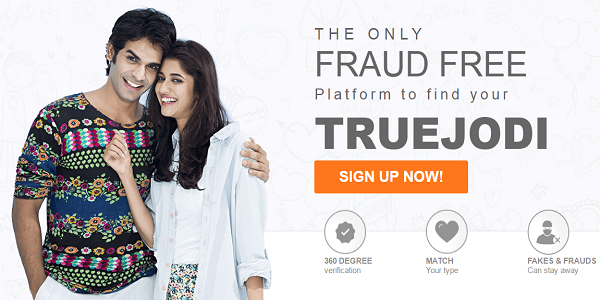 Truejodi is trying to solve this twin problem of removing fakes and bringing in transparency to matchmaking with 9 step verifications and zero-tolerance towards frauds. Users are awarded trust ratings based on the information they verify. This helps others take a better call on their match. More than 12,000 fan following over Facebook. Ravi Mittal started doing business at an early age of 16. He founded Truejodi after his friends and family using matrimonial sites to seek matrimonial alliances often cribbed about fakes and frauds on those sites. While matrimony is quite an important life decision, you often get bumped into a lot of fakes. Having seen this happen with close family and friends, Ravi thought that no matrimonial site was looking at authenticating profiles. This led him to build Truejodi – a reliable place to find a 100% verified match. The company was launched in Nov 2015 and in a short span has managed to gather a user base of 4000+ users. Out of these, 70% are female users. In just a mere 5 months, Truejodi has been successfully able to add about 4000 people on its website. The portal is growing fast and has become popular in very less time. Truejodi also has plans of expanding to other places soon. They have a big team working on making this happen with people from corporate and freshers as well. Truejodi is getting so popular for its genuineness. People love the fact that the accounts created are of genuine people and there is no fraudulence of any sort. The company is expecting to cross 300,000 users by the end of 2016 and help people find true life partners.